Spending money on luxury items is not a decision I take lightly. I don't have an endless amount of disposable income and any high end items that I buy, I always have to save for a long time to get them or have to sacrifice getting other things. So, when it comes to investing, I always have to ask myself a few questions first and I thought I'd write about the process incase any of you are thinking of saving up for any designer goodies! W I L L I U S E T H I S | It seems like I no brainer, huh, but investing in something you will use day after day is always the best place to start. I always write a list of everything I wear on a regular basis - great black boots, perfectly fitting jeans, a leather jacket, some shades, a staple bag - and then see what I think is worth investing in out of there. 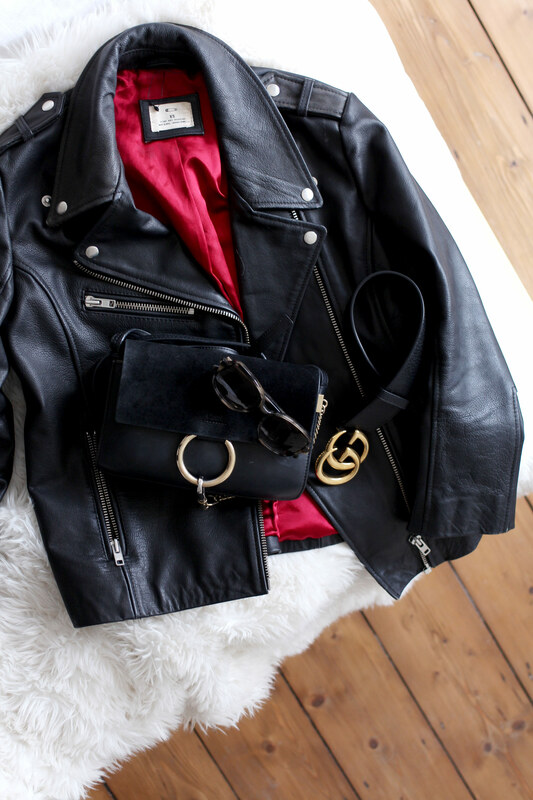 I tend to go for accessories, shoes and leather (though my jacket only cost £250 which is less than All Saints, but it's a good quality piece) as my items to spend cash on, and then I tend to skimp on the rest as you can get great basics and dresses etc on the high street. I must admit, and it's not me being a snob, but my bags get a lot more love and I feel weirdly special wearing them, more so than I ever did in Topshop or Zara. It's an odd feeling I guess, but I'd rather buy one nice pair of shoes than 10 pairs from the high street! I S I T J U S T A F A D | So, you've been saving for a while and you see a new bag come out and it's all over instagram and you need it. But, do you really? Trend pieces come and go, some turn into classics, some disappear and you can barely get half of your money back when you try to sell them. Unless you're head over heels for a particular collection, it's best to opt for classic investment pieces I think. I don't mean everyone needs to own a Chanel 2.55, but starting with something like a great black bag isn't such a bad option. That's what I did when I started my collection and they've been such necessary items in my wardrobe! W I L L I T G O W I T H E V E R Y T H I N G | This isn't all that tough in my wardrobe, as it's full of quite simple pieces, but if I buy a bright yellow bag then it's probably going to stick out like a sore thumb and I probably won't get much use out of it. When looking at a new purchase, picture 10 outfits it would go with and really look at the piece to see what style it fits in to. If it's a bag, for example, and it's more structured in shape whereas you wear more casual outfits, will it look too formal or can you work with the contrasting look? Is it too boho or too trendy or too loud? I always contemplate this for ages! H A V E I R E A L L Y T H O U G H T A B O U T I T | There's been lots of times I've desperately wanted something, but then when I've sat on the decision for a little while, I've got a bit bored with seeing it or I'm 'over' it. It takes me ages to save for things anyway, but this time does give me space to reflect on if I really need an item or it's just a lust thing. If I see myself still obsessing over it months later, then I know I need it in my life! So that's how I work out my luxe purchases! Oh and here's a few of my fave pieces below that I think are 100% worth investing in. Next Post You’ve Got To, Right?